Visit the Waterside shopping center on Marina del Rey’s Admiralty Way for lunch or dinner and you’ll likely see patient crowds, scrolling through Instagram and peeping Snapchat, standing in line to order a sandwich at the often mobbed Mendocino Farms or waiting to sit down at the similarly popular Sugarfish. Come here during any weekday, and one thing becomes clear: Marina del Rey, which attracts employees from nearby Silicon Beach offices, like the Playa Vista outposts of Facebook, YouTube, Microsoft, and Electronic Arts, could use a few more good restaurants. And with the recent news that Google has purchased 12 acres in Playa Vista and Yahoo is planning to move from Santa Monica to Playa Vista, you can feel the ground shifting on the Westside. With all these deep-pocketed newcomers to feed, it’s no surprise that major chefs and restaurateurs are ready to get their feet wet. Here are five reasons why Marina del Rey and Playa Vista are on the verge of becoming the center of Silicon Beach eats. Former Superba Snack Bar chef Jason Neroni and restaurant mogul Bill Chait’s buzzing new collaboration, which opened this month in the former Paiche space, proves that people will happily pay top dollar for a proper version of fish and chips ($29, made with excellent haddock and served with a side of Green Goddess salad on the night we visited). 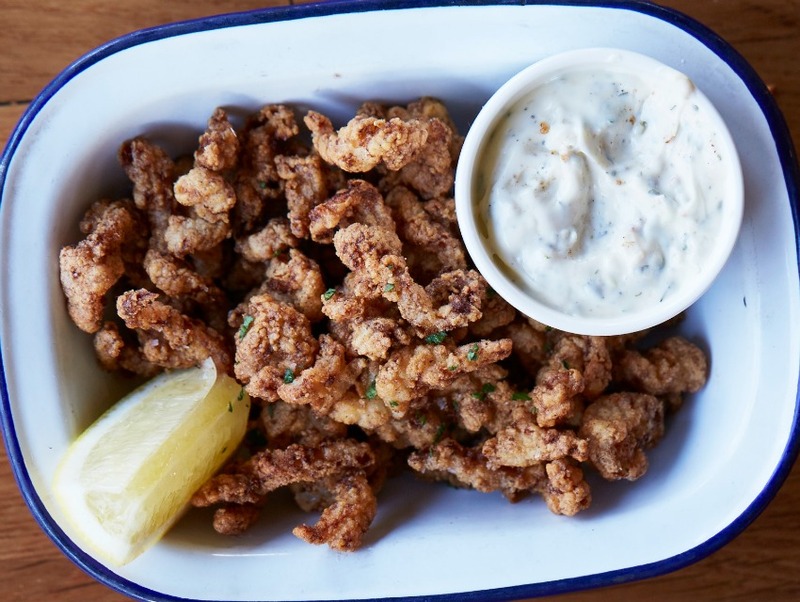 The “Ho-Jo” clam strips, lobster rolls, and raw bar complete the transporting image of a fancified East Coast-style seafood shack from a chef who doesn’t shy away from using ramp butter to turn his spaghetti with Dungeness crab green. Which is to say, expect this menu to evolve as seasons—not just in California, but around the country, in places where they actually have seasons—change. Former Eva chef Mark Gold is also going big with seafood at his restaurant in the new Marina del Rey Hotel. He uses 3 1/2 ounces of Dungeness crab in each Crab Louie salad and makes his own remarkable rendition of fish and chips with Alaskan true cod. Sit outside on either patio and enjoy the best of boat worlds. What could quickly become Marina del Rey’s most high-profile restaurant is expected to debut in the late summer. Josiah Citrin, the two-Michelin-starred chef/owner of Santa Monica’s Melisse, plans to go casual and to go wild with this meatery near the Venice pier. Expect wood-fired, smoked, and grilled meats, as well as a tartare bar serving beef heart and lamb. A Cinemark movie theater has already opened at this dining/shopping/entertainment mega-complex, and a Whole Foods and restaurants, including an 800 Degrees pizzeria, Hopdoddy Burger Bar, Sol Cocina, and an outpost of Sawtelle dumpling slinger ROC Kitchen, are coming soon. Playa Vista is built to be a family-friendly, walkable community, so expect a lot of strollers in line alongside tech employees at N’ice Cream. Yes, there might be reasons to boycott Chick-Fil-A, but as food-loving comedian Aziz Ansari has pointed out, there are complicating factors. Regardless of how you feel about this chicken-sandwich purveyor’s politics, you can’t deny that its new restaurant at the edge of Playa Vista is a big deal. The drive-through line is often as crowded as that of the Venice In-N-Out, and if you dine inside, you’ll likely be pleasantly surprised when employees walk around asking if anybody needs a refill. If you want to work up an appetite first, the nearby L.A. Clippers training facility is adjacent to a Playa Vista park ideal for both grown-ups looking to play pickup hoops and toddlers addicted to slides and sandboxes.